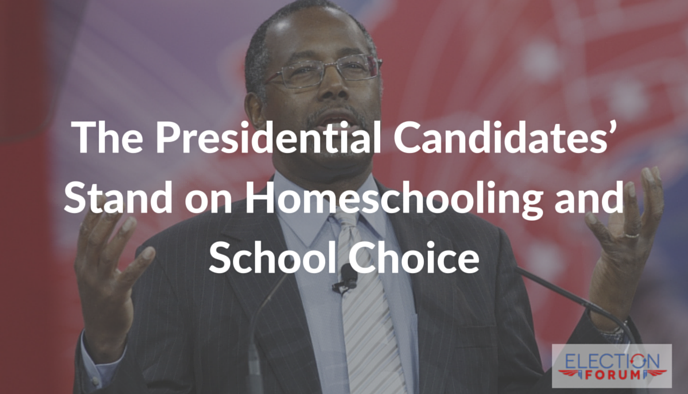 The Election 2016 Presidential candidates hold diverse views on homeschooling and school choice. Donald Trump states, “[O]pen the schoolhouse doors and let parents choose the best school for their children. Education reformers call this school choice, charter schools, vouchers, even opportunity scholarships. I call it competition-the American way.” Trump seems to be a good supporter of school choice and homeschooling considering that he wishes for more competition in the education system. Ted Cruz is a strong proponent of school choice, and has stated multiple times that he will focus on the issues of education, school choice, and homeschooling during his presidential campaign. One of the strongest supporters of homeschooling and school choice. Watch Videos for Ted Cruz’s views on School Choice here. Clinton says, “I believe strongly in a parent’s right to choose the best education for his/her child. We have a proud tradition of parochial and private education in America. We also know that the majority of children are educated in the public education system. So we have to support the public education system whether or not our children are in it or whether or not we have children. The public education system is a critical investment for the well-being of all of us.” She is obviously a strong proponent of supporting the public school system. She also does not support vouchers, and believes that they drain desperately-needed resources. She is not friendly to the homeschool system. To learn Bernie Sanders’ views on School Choice, click here. To learn Rand Paul’s views on School Choice, click here. Watch Videos for Rand Paul’s views on School Choice here. He is a moderate supporter of homeschooling. He supports school choice; however, he does not support it as strongly as other Republican candidates. He is a strong believer in school choice, and he also believes that America’s public school system is holding kids back. Watch Videos on Chris Christie’s views on School Choice here. He signed NJ onto common core, but he now regrets that decision. Overall, he is mediocre when it comes to school choice. While he advocates for school choice, he does not make it a primary issue or concern. Watch Videos on Carly Fiorina’s views on School Choice here. She believes that the common core system is failing. Not an incredibly big supporter of homeschooling and school choice. He believes that the current public education system has become a massive propaganda system. Furthermore, he supports homeschooling very strongly. He favors charter schools where independent groups receive state authorization and funding to establish new schools. Bush says, “Our education proposal would allow vouchers for children in chronically failing schools so that they could attend another public or private school.” He is not an incredibly strong supporter of school choice. He stated the following: school choice for all: public or private for all kids, replace entire school board for failing schools, support displaying the Ten Commandments in public schools, ending school prayer was one step in society’s moral decay. He is one of the strongest supporters of school choice and homeschooling. Opposes education vouchers. Offer every parent Charter Schools and public school choice. Opposes homeschooling and school choice. Wanted to award 10.2 billion dollars to federal education and HHS projects. He opposes school vouchers, and he does not favor homeschooling or school choice. Strong proponent of the public education system. Rated 27% by the NEA, indicating anti-public education votes. He favors homeschooling and school choice. He believes the education system is not working. Supports school choice strongly. Encourages school prayer in public school classrooms. Supports homeschooling. Raise teacher pay with local funds. More support for traditional African-American universities. Moment of silence does not infringe on students’ rights. Calls for a voucher plan in Virginia schools. Does not strongly support homeschooling or school choice. He wishes to hire more public school teachers. Thanks for the info on candidate positions on education and reform. I am concerned that none of them appear to acknowledge that charter schools are setting the trend for unelected school boards and disbursement of public tax dollars with no oversite. I do not see any of them acknowledging that directing the public dollar to the individual student, called backpacking, is another trend to disburse the public dollars without any elected representative oversite. Conservatives should be opposing the concept of school choice, if this means providing monies without our elected school boards determining the funding or having any accountability over the funding. There has been a movement for many years to eliminate elected school boards. Senator Di Fi has promoted this in the past. Charter schools are government schools using public monies and usually run by non-profit corporations or foundations. Criticism is not about type of education but about lack of taxpayers’ representation in use of their monies. Public/private partnerships use public monies for private enterprises without public input. Charter schools will eventually eliminate private and religious schools which will not be able to compete lacking funding.